Antique items sold by Ghilli are always certificated by the socalled statement of authenticity document. 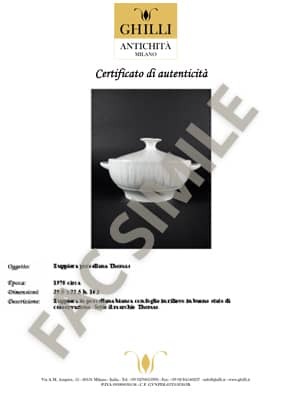 This is a signed declaration which describes the sold items, shows images, measures (size / weight), origin, period and author or attribution. The warranty certificate together with the sales receipt or invoice confirm the purchase and ownership of the asset by the purchaser. The seller is responsible for the statement. The Italian law n. 42/2004, which included a “text only” to the various provisions scattered on the artistic and cultural goods, established in this regard that those who sell works of art of painting, sculpture or graphics, or objects of antiquity or historical interest and archaeological heritage, has the obligation to deliver to the purchaser the documents certifying the authenticity of the work or object, or at least, must submit the documents relating to the probable attribution and provenance.